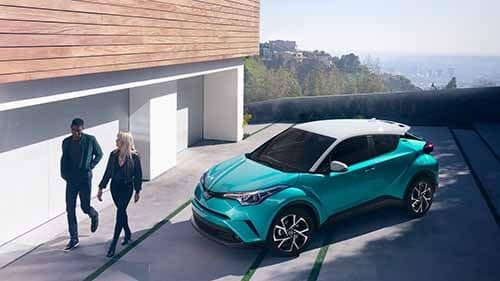 The 2018 Toyota C-HR is a unique entry into the crossover SUV segment, bringing affordability and efficiency alongside versatility, technology, and space. Explore some of the most advanced safety features on the new Toyota C-HR here, including Toyota Safety Sense™ P (TSS-P) and the Blind Spot Monitor (BSM) with Rear Cross Traffic Alert (RCTA). If it looks like the C-HR has what you’re looking for in a subcompact crossover, make the trip from Pooler to Savannah Toyota today! Standard on every Toyota C-HR, TSS-P is an advanced lineup of driver assist features that helps give you a clearer picture of what’s around the car and can also intervene to help avoid an accident when necessary. Operational at city and highway speeds, this part of the TSS-P package is able to automatically brake and accelerate for you based on the speed of a vehicle in front of yours. If there’s no obstruction ahead, it automatically maintains your cruise control setting. Also part of TSS-P, this feature recognizes an imminent forward collision, warns you to apply the brakes while preparing brake assist, and automatically applies braking force if you fail to act in a timely manner. When you switch your turn signal on, the BSM’s sensors can detect a vehicle in your blind spot and warn you of its presence, while RCTA uses similar technology to alert you if there’s a vehicle quickly approaching behind you. The 2018 Toyota C-HR has been designed using high-tensile steel, which helps protect front and rear seat passengers in case of a collision. Every model comes standard with ten airbags, the Star Safety System™, and the rest of the TSS-P driver assist package, which also includes Lane Departure Alert with Steering Assist (LDA w/SA) and Automatic High Beams (AHB). You can find the 2018 Toyota C-HR crossover SUV for sale at Savannah Toyota, so stop on in for a tour of its many safety features. We’re located at 11101 Abercorn Street in Savannah, GA. While you’re here, be sure to check out the entire new Toyota lineup. Contact us at (855) 411-6139 to schedule your test drive.